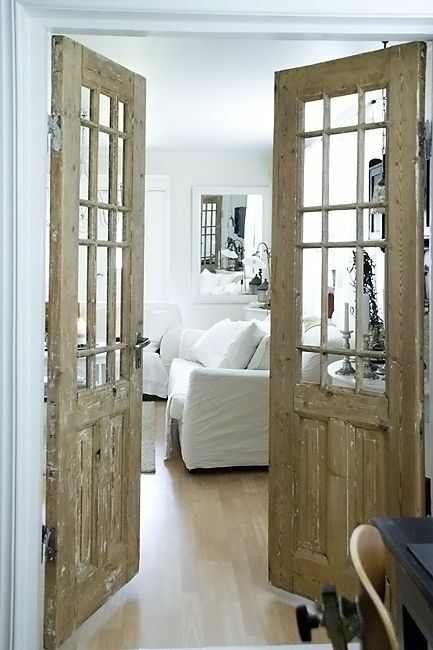 You may remember how I painted our lounge room french doors a few years back from woodgrain to white. I liked the white, but they were always chipping here and there and I had already repainted them once, and then Pinterest started calling me and saying why not go for a weathered wood look. Damn that Pinterest. So I charged in and using paint stripper and a scraper, took off all the white paint on both doors. Getting into the little grooves was a pain and took forever to scrap out. It was near impossible to get every little bit of paint off. Then I took one door off and took it outside. I sanded it with my belt sander to bring it back down to the original grain. The grooves around the glass I just used sandpaper. Then I used Cabot's Walnut stain to brush on and wipe off. To achieve the weathered look, I dry brushed areas with white paint, Then using a wet rag, rubbed the white paint in. Then I put the finished door back on. I wanted to compare the difference. I love the walnut brown so much better than the original orangey brown. And here are both the doors all finished. I love the contrast with the white door trim. You can still see some of the white paint in the grooves if you look closely, but the stain covered most of it and it all adds the weathered look I was trying to achieve. And finally I applied 2 coats of clear satin varnish. I didn't want the doors to be shiny, but I also wanted them to be projected. This entire project good me 5 days straight, and although I am very happy with the way the doors turned out, I will not be sanding and re-staining any more doors for a long time. Julie, they look terrific!! I love the update, it adds a ton of style and charm. That darn Pinterest was right again!! Love the doors Julie-labor of love! Picking the right finish is so complicated! I like the white and I like the final wood finish. I'm going to keep this in mind when I start painting something white next time. The new look really brings some drama to the room...it looks great! love love love the after!!! 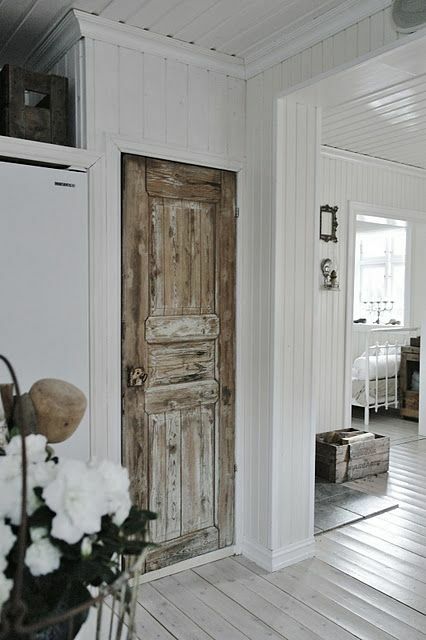 Gorgeous doors! I love love love the natural wood over the painted. Just discovered your blog through Silver Pennies Sundays.